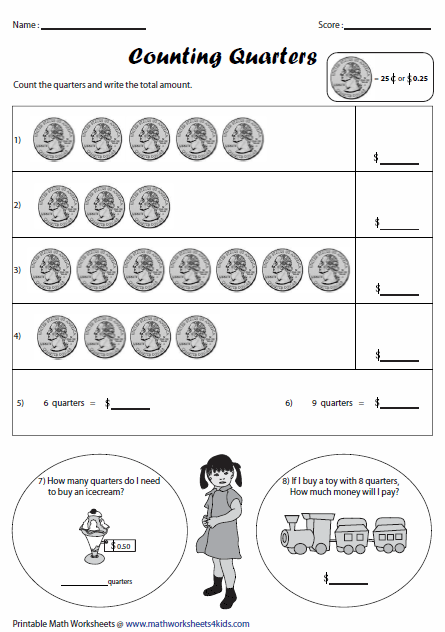 Money worksheets contain counting all U.S. coins such as pennies, nickels, dimes, quarters, half-dollars and all U.S. bills. 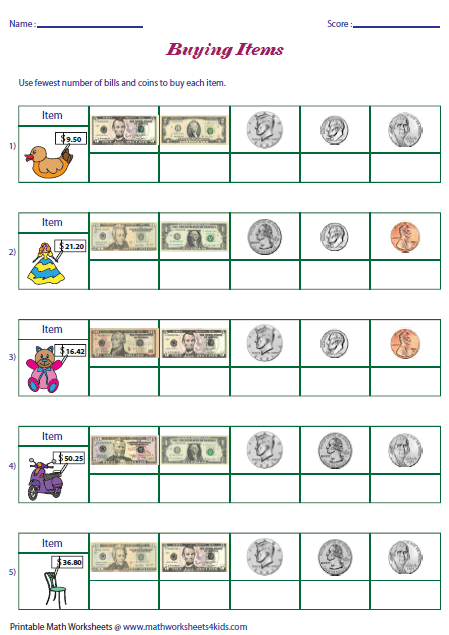 Each counting money worksheet has at least two word problems except for pennies. 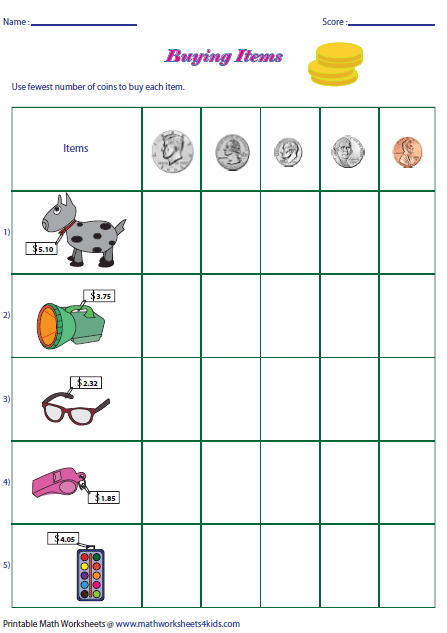 It also contains finding equal amount of money, identifying least number of coins and bills, equivalent amount of coins, money charts and money word problems. 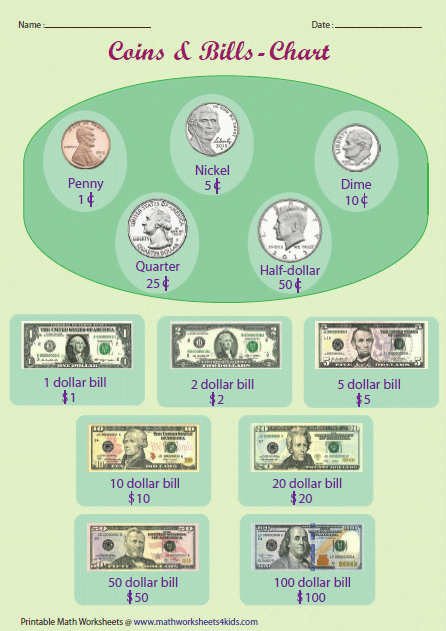 Printable money charts help teachers and homeschool moms in teaching money to their kids. 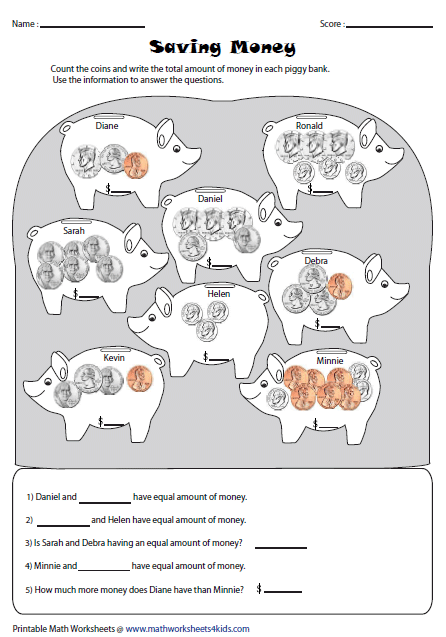 Count the pennies and write the total amount under each piggy bank. Order your answers from least to greatest. Write the alphabet associated with each answer arranged in an order and find the mystery animal. Count the number of nickels or dimes and write the total amount in cents. Two word problems included in each worksheet. 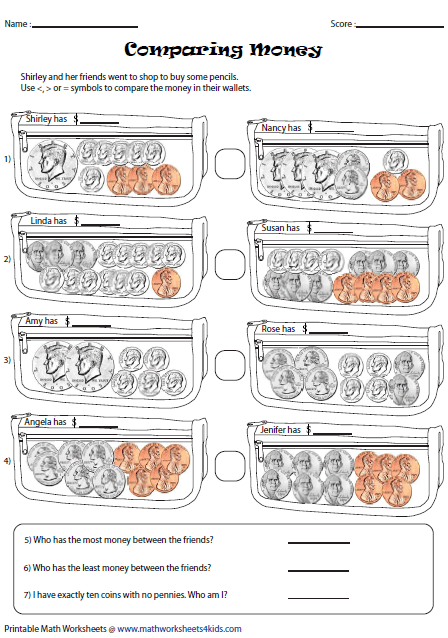 Word problems in nickels contain wallet theme and dimes contain toy theme. 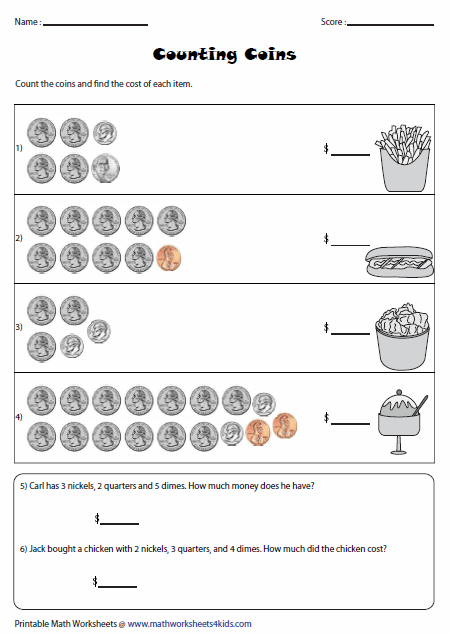 Count the number of quarters or half-dollars in each problem and write the total value of the money. Two word problems included. Count the coins to find the cost of each item. 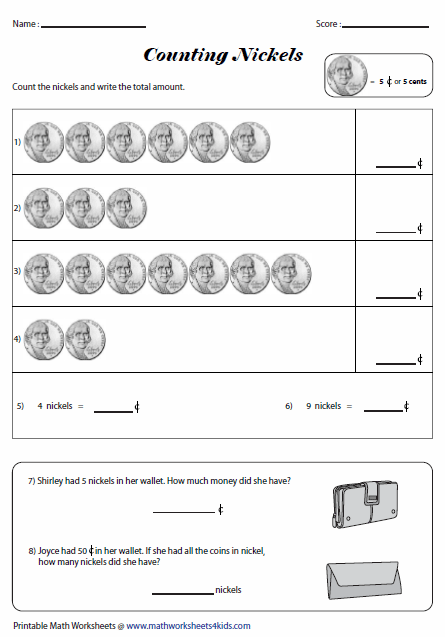 There are two counting word problems in each worksheet to reinforce the knowledge in counting U.S. coins. Count the bills and find the amount. Match the money in each section with the item showing same amount. There are items listed with price tag. 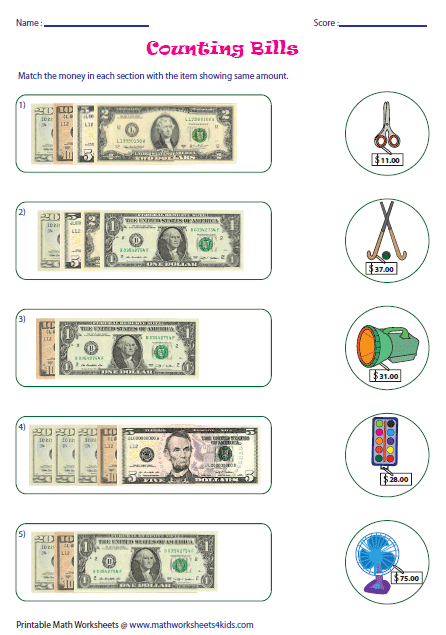 Count the amount of money in each question and write the correct alphabet to show the item you can buy with that amount. Count the coins on both wallets. Use >, < or = symbol to show more, less or equal amount of money respectively. Based on information, answer the questions. 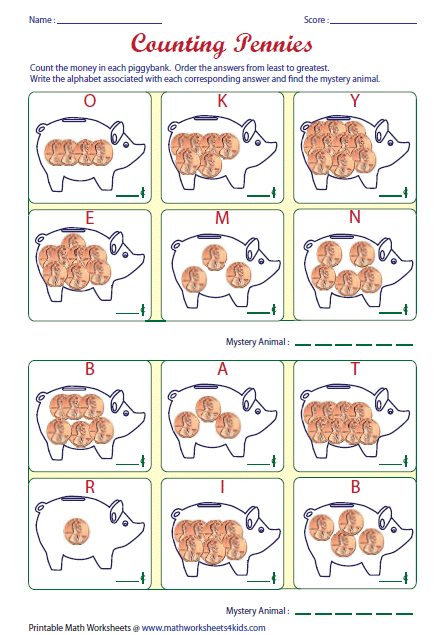 Find the amount of money in each piggy bank. Answer the five word problems based on having an equal amount of money and comparing the amount of money. Each worksheet has five items for sale. Use the fewest number of coins to buy each item. Each worksheet has 5 problems identifying the fewest number of bills and coins required in buying items. Each worksheet has two sections. 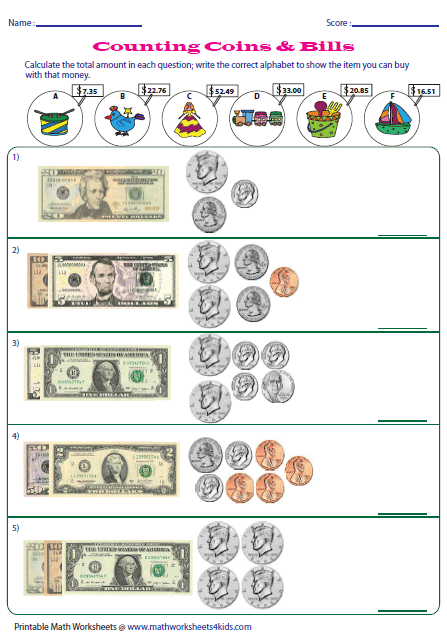 First section is about matching equivalent coins and second section is about writing equivalent number of coins. 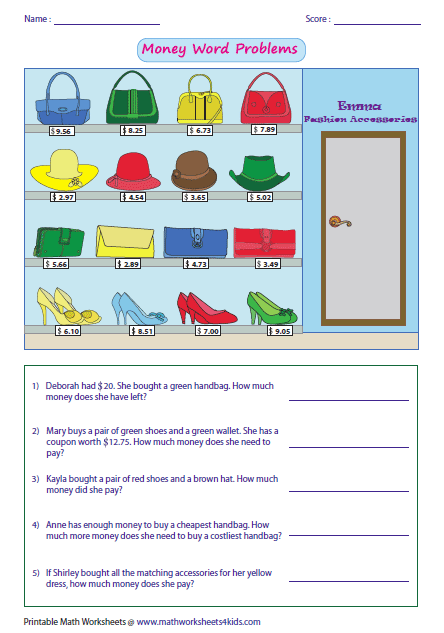 Each worksheet contains five story problems based on addition and subtraction. 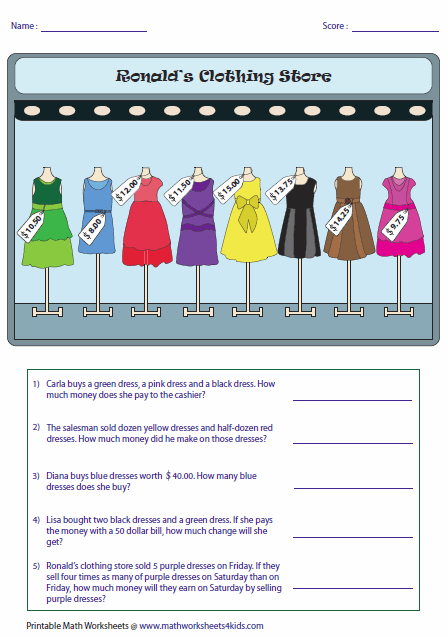 Multiplication and division word problems contain different scenario in each worksheet to understand real-life situations. 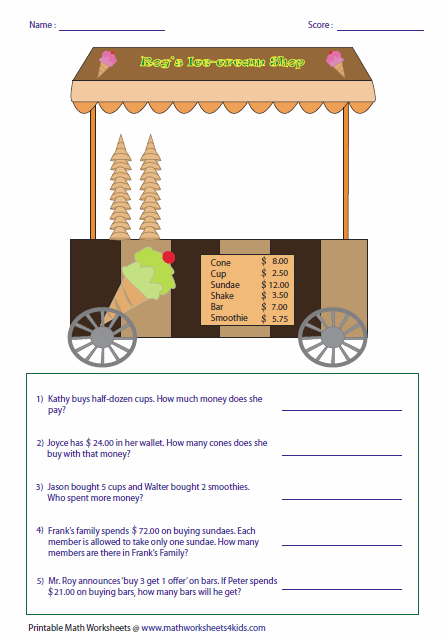 Money word problems contain themes to reinforce the knowledge in understanding addition, subtraction, multiplication and division involving real world situations. 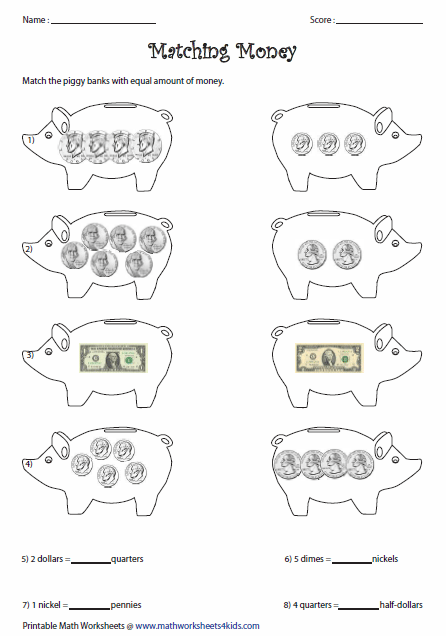 Learn the indispensable subject of rounding and estimating money with topics like rounding dollars to nearest tens and hundreds, estimating the sum and difference of cents, dollars and much more!